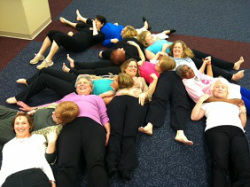 Throughout the year we provide a series of fun workshops to survivor groups, mostly in the NC / SC areas. Everything is based on a theme of EXPLORE, PLAY, and STRESS-LESS! This workshop explores the disease fighting power of vibrant, fresh, colorful, organic fruits and vegetables with an energetic tasting demonstration of rainbow juice bombs. Cheryl LeCroy of Creative Juices Consulting has an array of motivating workshops to offer. A favorite is her Smoothie Party! This workshop centers on the importance of simple daily body movement as a pathway to increased energy and renewed focus. Includes elements of yoga, Tai Chi, Qi Gong and various breathing techniques. 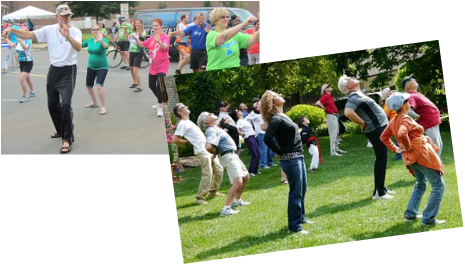 We frequently work with favorite instructors including Tai Chi Mike and Glenna Sears-Brinker (Qi Gong). Also, Shannon Carney, offers Yoga for the Heart and specializes in gentle yoga for cancer survivors. This workshop helps you learn how to quiet the mind, reduce anxiety and increase calmness in your daily living. You can expect hands-on experiences including Meditation & Mindfulness, Guided Imagery, Deep Breathing, Laughter and Inspirational Storytelling. And as part of this workshop, participants go home with their own copy of our Grammy considered Wind River Relaxation CDs. To get a sneak-peak of this 2 disk set, click here. This workshop gives you the opportunity to play and have fun while teaching you how to tap into creativity to regain control in your life. 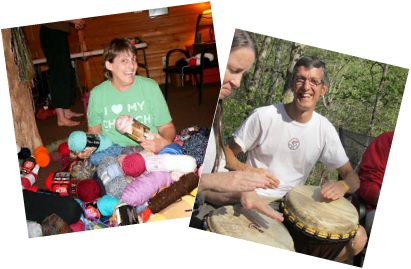 Depending on the group, we will mix in creative healing arts, painting, crafts, music and more! We will leave your mind to imagine the rest! We focus on overall wellness and start with where each person is at today. No experience is ever necessary! Workshops are customized to your group’s needs.